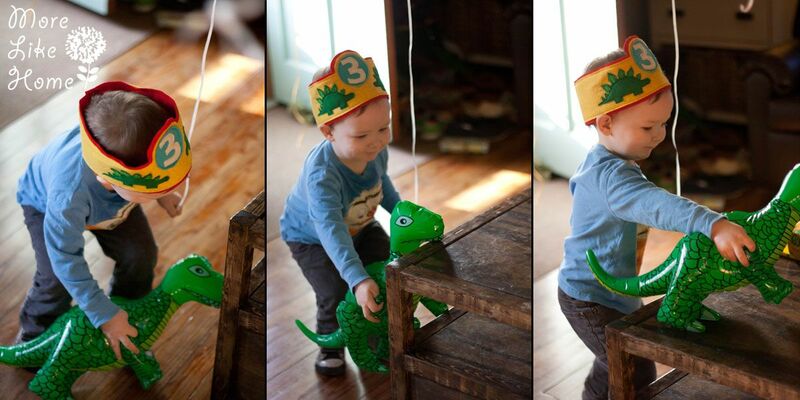 To keep our party for Big Brother simple, the only thing I actually made was his special-request "dino hat." I think he liked, since he hardly wanted to take it off! It was pretty simple to make and very cheap (we had all the felt already!). 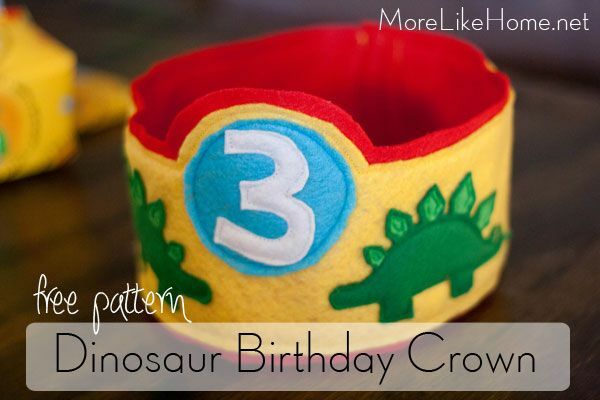 Today I have a free pattern for anyone else who needs a dinosaur birthday crown for a little birthday boy! Ready to get started? Start by printing the pattern and cutting out the pattern pieces (download the pattern here). Cut out the felt pieces indicated on the pattern (it's hand drawn so bear with the uneven lines, straighten them out if you can). It's easier if you trace the pieces onto the felt with a fabric marker and then cut them out. 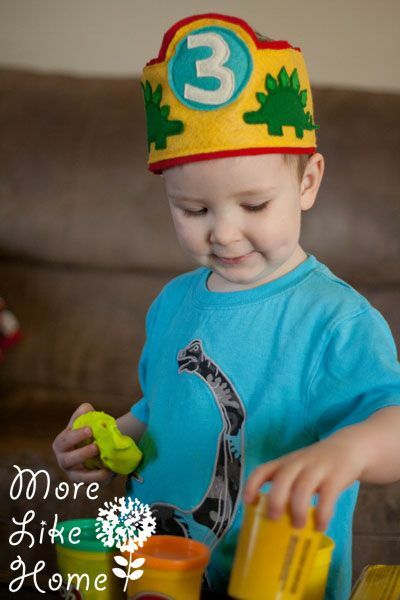 The red & yellow crown pieces just show the center section - make sure you leave long tails on each end so it will reach all the way around the birthday boy's head! Layout all your pieces just how you want to make sure they line up well and pin them in place (it will be opened flat, not a round hat shape yet. I don't have a picture of it in progress, sorry!). Then work from the bottom layer up to sew all the pieces on. 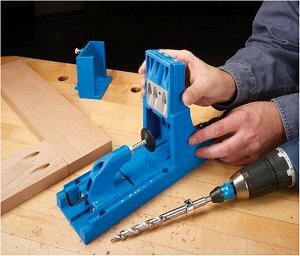 Sew right around the edges. (I used a red bobbin the entire time so it would blend on the back better. 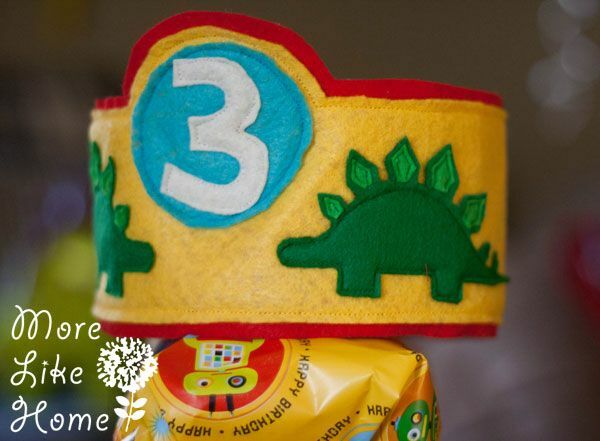 I just switched the top spool when I changed colors) So first I sewed on the yellow layer, then the blue circle, then the number (you can switch in another number that's about the same size), then the dino body, then the dino plates. 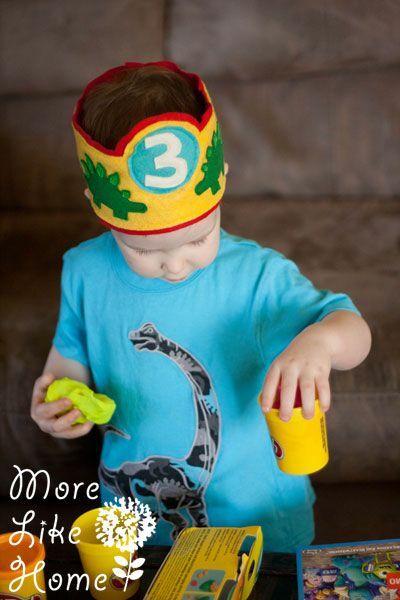 Once all the pieces are attached measure your little fella's head to see how big it needs to be. 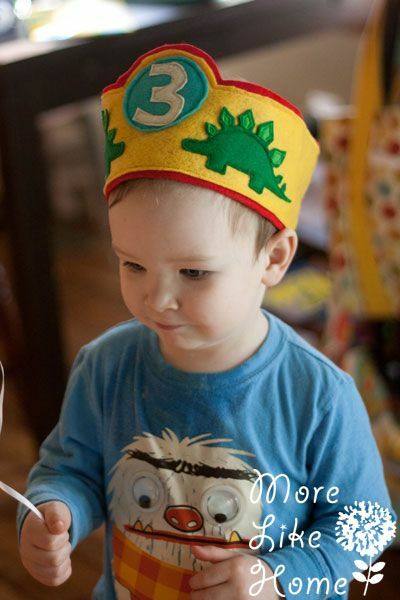 You can either use a soft tape measure or just wrap the hat around his head and mark the size (that's what I did). Leaving about an inch of overlap, cut off any extra felt. Stitch it together along the overlapped section. All done! I'm sorry I didn't have any pictures of the steps. Hopefully you made it through okay! Now just add a couple inflatable dinosaurs and call it a party. 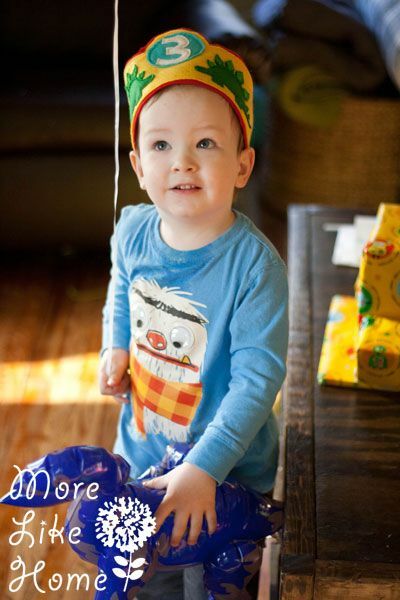 A new dino birthday shirt doesn't hurt either. 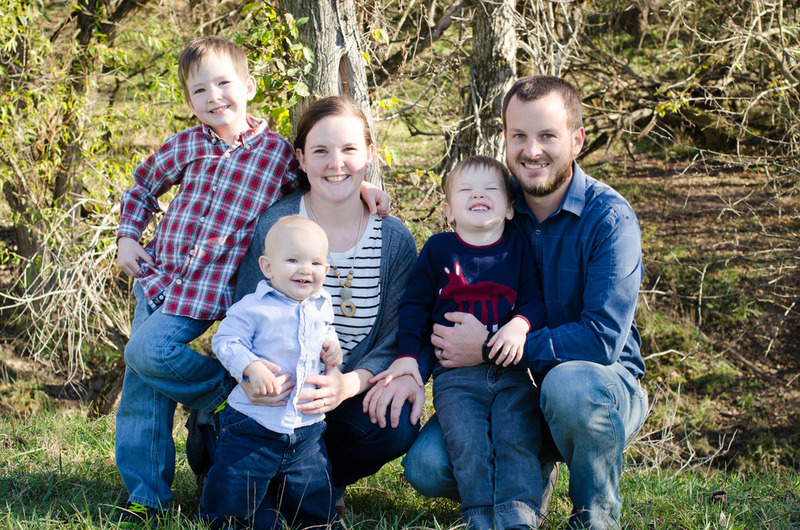 Do you have any special birthday traditions? 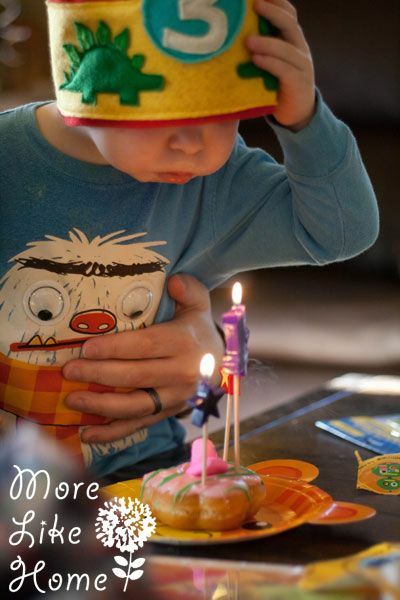 Do you make a birthday crown (or something else) every year?